It’s been a pretty routine week. We have approximately two weeks of adjustments left on our current schedule. We’ll be visiting Dr. Paley for another routine appointment next week so hopefully we don’t get any additional days of adjustments. Drew’s left leg is so very close to being straight, but not quite there yet so the extra time is needed. The adjustments have been slightly painful for him since they were extended, but he’s bearing with the pain pretty well. Drew was slated to visit his Nashville cardiologist early January for a routine follow-up, but seeing as we are 1000 miles away, we were unable to attend. 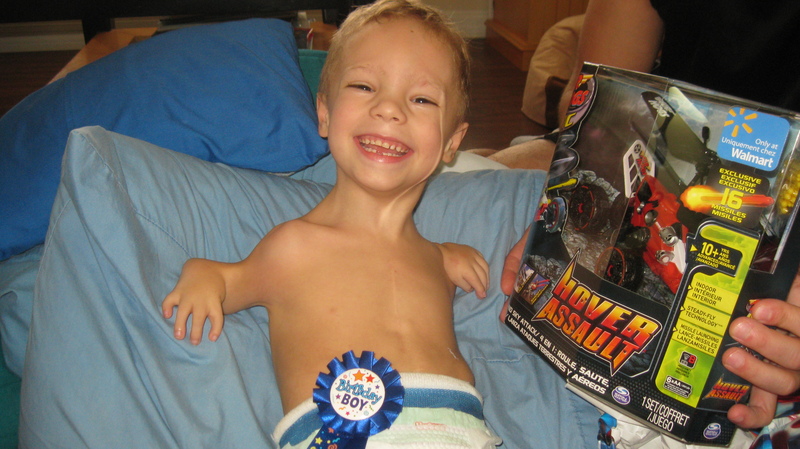 Instead, we visited a local cardiologist here that has seen Drew before. They performed an ultrasound and an EKG. Drew did really well throughout the long day despite having to wait so long to be seen. He did have an episode of leg pain (cast leg) that interrupted the ultrasound, but hero Daddy remembered to pack the pain medicine so we nipped that in the bud fairly quickly. We haven’t heard from the doctor regarding any findings so I hope that no news is good news. I’ll be following up with them tomorrow. Drew is amazing with the controller though. It’s fascinating watching him as you wouldn’t expect him to be so coordinated and agile with this large controller with buttons so spread apart. 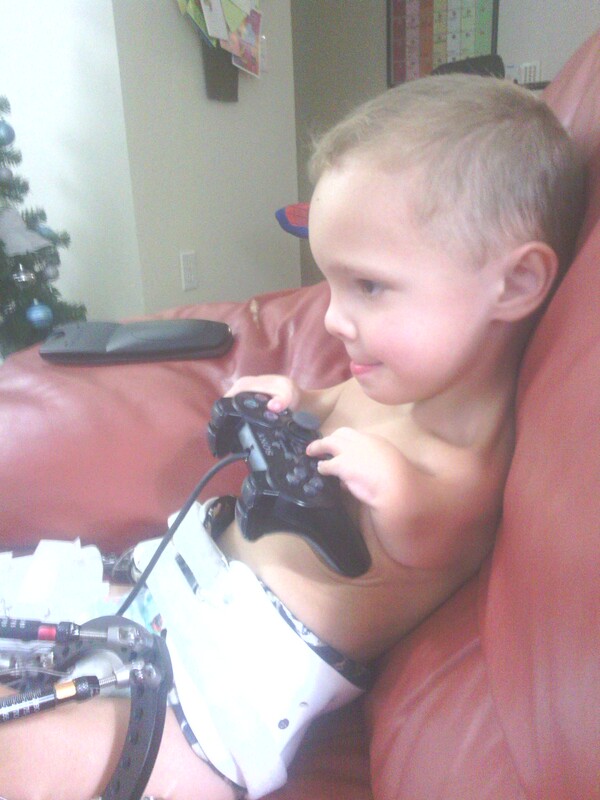 But, he knows what every button does and when I play, he’s constantly “tutoring” me. Him and Daddy have already beat several games together. But, Daddy and I are trying to do little things to keep our sanity. Daddy works out a lot. I took up a new hobby of knitting. Every once in a while, we’ll take turns catching a movie (by ourselves while the other stays with Drew) at a nearby theater. It’s gotten to the point where we each look forward to trips to Wal-Mart for the simple fact that it’s out of the house. When it becomes apparent that a grocery trip is needed, Nate and I eyeball each other and the set of keys and you can almost hear the faint whistle of an old Western tune. We are both looking forward to coming home and mostly anticipating May/June when we estimate the leg surgeries will be complete. There will be lots of work to do afterwards, but it’s going to be so much better when Drew’s legs are free from metal. Drew’s fixator leg has really suffered the lack of showers due to the cast. His pin sites are looking very desperate, collecting gunk and starting to drain. We do proper pin cleaning, of course, but showers always helped soften everything up and made for sem-easy removal. But now a damp dishcloth and anti-bacterial soap just isn’t doing enough to clean his sites of all of the debris. We could use tweezers, but tweezers may as well be a chain saw when it comes to getting in arm’s length of Drew. He has a few very sensitive pins that even the softest of wash clothes will spark pain. Being fed up, disgusted and fearful of an infection, I decided it was time for drastic measures. Daddy returned from a movie just in time to help me carry out my plan. I meticulously wrapped and taped up a garbage bag around his cast leg and around the cast on his abdomen to ensure that it would stay completely dry. I didn’t want Drew to lay on the hard surface of the tub for fear that he would be uncomfortable so we wrapped a pillow in a taped up garbage bag for his head and rested him on a life-preserver seat that you see in pontoons. 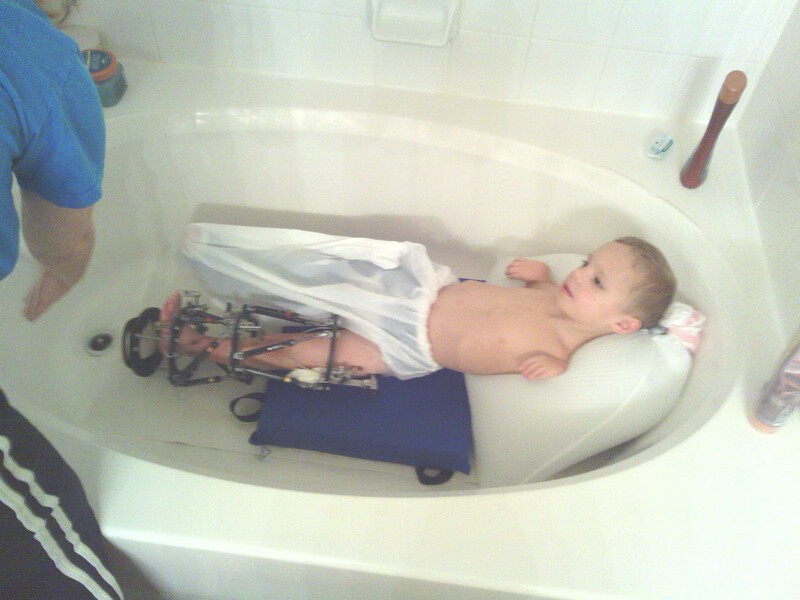 Drew laid back in the tub and I used the shower head to spray his fixator leg for about 10-15 minutes. Daddy did the scrubbing with the soap as my baby bump would have been uncomfortable on the wall of the tub and it was such a relief to clean his pins of all of that stuff. It sure needed it. But, it was such a difficult process, we decided we can only do it about once a week so in between we’ll do sponge baths, but tomorrow he’s due for a thorough cleaning. He was actually due today, but today was a special day. We celebrated Drew’s birthday early. Daddy is flying home Wednesday next week and he wanted to be here to enjoy playing with Drew’s presents most specifically a remote-control helicopter. So, despite it being two weeks early, I baked him some superhero mini-cakes, blew up balloons and Daddy helped wrap the presents. We had our own little private party. We didn’t have anybody over though Drew does have two friends here. But, we don’t really know how Drew feels being left out of play that other kids get to enjoy. We didn’t want to do any games that Drew couldn’t participate in which pretty much eliminates everything. Drew does play with toys on occasion even being stuck on the floor, but it’s not same and he just isn’t able to enjoy them the way he could if he was more mobile, even if he just had a fixator. Maybe it was more selfish reasons, but it’s just sad seeing poor Drew stuck in his cast and his fixator next to fully mobile and free kids. But, we are planning on having the HUGEST party when we get back to Kentucky for good complete with backyard grilling, games and lots of friends and family. It’s going to be one big celebration of one long year! I’ve been terrible with keeping up the photo documentation of Drew’s leg progress…how terrible of me. There’s just been so much chaos this time. 🙂 I’ll get one soon, I can’t wait for y’all to see how straight his leg is. YOU ARE INGENIOUS! I LOVE READING YOUR POSTS. WE ARE SO GLAD THAT DREW IS DOING WELL. HANG IN THERE. LOTS OF PRAYERS ARE GOING UP FOR YOU ALL.